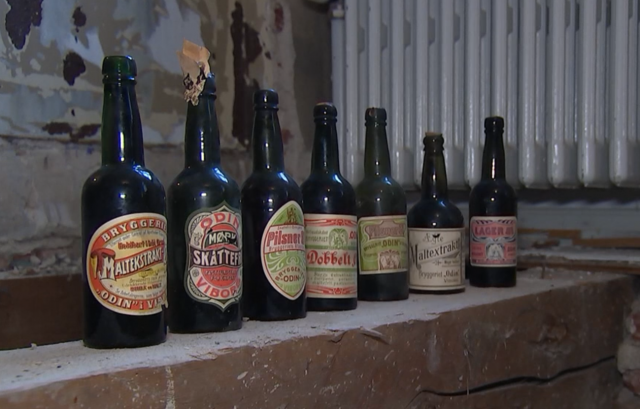 Construction workers in the city of Viborg in Denmark have uncovered seven bottles of 113-year-old beer under floorboards in a building which once housed the Odin Brewery. Founded in 1832, Odin Brewery was later closed in 1988, and at the time was Denmark’s oldest brewery, according to The Copenhagen Post. Construction workers renovating the building were shocked to discover seven, unopened bottles of beer dating to 1906, stowed inside a wooden box beneath the floorboards. The news site later revealed that unfortunately, two of the corks had perished and the beer had evaporated, but the five remaining bottles remained full and in good condition. Accompanying the beers was a note, handwritten by the then head brewer, CE Pehrsson. Dated 20 March 1906, it read: “The old floor was removed by master carpenter Niels Nielsen and a new floor was added. As we don’t know how long this floor will last, these words and some bottles of beer we brew these days will be put under the floor. In 2008, fellow Danish brewer Carlsberg made a similar discovery, uncovering bottles of its own beer dating back to 1883. In 2016, it was able to recreate the beer after extracting living yeast cells from one of the old bottles. Other brewers have been able to complete similar feats. In 2016, Herzl Brewery in Israel used a rare type of grain to make a beer that would have been drunk at the time of Jesus, while an archaeological find in Peru inspired a US brewery to create a limited-edition pre-Incan beer. Back in 2014, Belgian scientists and a Finnish brewery re-created a mid-19th century beer from samples salvaged from a shipwreck in the Baltic. In recent archaeological beer finds, last month road workers completing a £1.5 billion upgrade in Cambridgeshire stumbled across what archaeologists believe to be the earliest evidence of beer ever uncovered in Britain, identifying fermented residue dating back to 400BC.